Gyromancy is divination by spinning in, or walking around, a circle with letters marked on its circumference. When the gyromancer falls or stumbles outside the circle, the letter where the circumference is crossed is chosen. The gyromancer repeats this until an intelligible sentence has been formed (or until the gyromancer dies or goes mad). 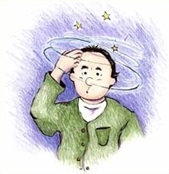 The dizziness brought on by the spinning or the walking is intended to induce randomness or an alternative state of consciousness under which the letters are "selected".